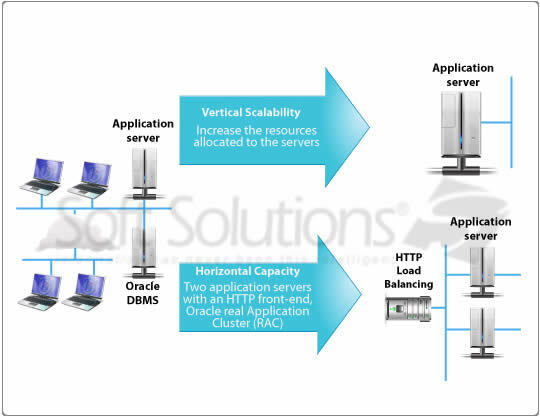 The ibs Suite is a classical Java Web application relying on a database server, a Java application server, and an optional HTTP front-end. The application is accessed through a browser	connected to the HTTP front-end or the application server through a TCP/IP	LAN. Both, the 'database server' and 'application server' make up what we call the "environment". Depending on the purpose of the environment (i.e. demonstration, mission critical application, ...), the relevant components can be installed on a single hardware up to a set of highly redundant servers. Scalability can be achieved vertically (high-end servers with lots of resources), or horizontally (multiple clustered mid-sized servers). Deciding on the infrastructure depends on the importance of the application, budget, maturity and type of existing infrastructure, and cultural factors (like the	influence of a dominant IT supplier). Development: This environment is often managed by Soft Solutions' staff, where application patches are installed and tested before delivery to the client, and can be located either at Soft Solutions' premises or at the client's site. Functional Testing: An environment used by Soft Solutions and the client to test the newly received	application, modules, and patches. Integration Testing: An environment used by Soft Solutions and the client to test the	inbound/outbound interfaces (data consumed by the ibs Suite and data exported by	the ibs Suite). Training: Depending on the	project organization, the training of the client's employees is either done on	a functional testing environment or on a dedicated environment. Pre-production: This is a mirror image of the production environment (i.e. in terms of connectivity for the interfaces, scheduling of the batches, software versions, etc.). Production: This is the "live" environment typically used by end-users. Clustering technology can be used for reliability purposes. Alternatively, the pre-production environment could act as a backup. Disaster Recovery: A separate environment is often located at a site away from the client's geographical data center location. The disaster recovery environment is used as a fallback in case of catastrophic problems at the	production site. The technology used here is to keep the disaster recovery site	synchronized with the production environment. The time needed to switch from one site to the other largely depends on the severity of the issues related to	the system and on the available budget. Integral IT resources are designated for maintaining multiple environments required for a project's progress. When it comes to hardware sizing, various approaches can be taken: sizing according to similarities, start small	and grow big over time, and timely estimates of the target	architecture. When sizing according to similarities, choose a similar	existing running application for reference of hardware size, functionalities, data volume and user base. This exercise gives you a very rough estimate of what may be needed for a new project. Some customers prefer to start	small and add relative hardware when required. 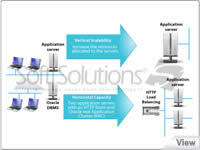 It is easier to add an additional application server to a server farm made of entry/mid-range standardized servers. In some cases, the client requests an accurate configuration by our team. To certify that the hardware will meet stated performance criteria, a benchmark is conducted on a hardware configuration relatively close to the client's chosen solution.